Access to Little Gasparilla Island is by private boat or private passenger ferry only. Just a 5 minute boat ride from the Placida mainland, near the entrance of Boca Grande, Little Gasparilla Island is truly a beach getaway. 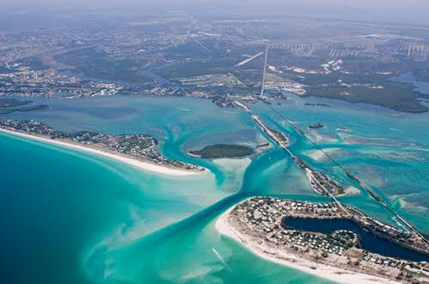 With miles of beachfront and ICW water frontage, the barrier island of Little Gasparilla Island is located just to the north of Boca Grande, separated by Gasparilla Pass which leads directly out to the Gulf of Mexico. Don Pedro State Park and Palm Island are to the north. Popular with Floridians looking for a weekend or summer escape, it is located only 90 minutes south of Tampa and Polk County. Many owners keep their boat in Gasparilla Marina or Aquamarina Palm Harbour dry storage for easy private access to the island at any time. There is also parking and a passenger ferry available by appointment located at Eldridge Marina on the mainland of Placida which offers wet slips as well, mainly to Little Gasparilla Island property owners. Due to LGI being a bridgeless barrier island, prices for bayfront of beach front homes and lots are drastically less that what you will find on other area barrier islands. Building materials are transported from a barge kept at Eldridge Marina and there are many experienced contractors that specialize in building on Little Gasparilla Island.